My nephew Danny is planning a family get together this weekend at his house in Lincoln. Us Bay Area folks are planning on going but there are questions about who is staying overnight, how we can car pool, etc. Mom sent me an email yesterday with a bunch of things on it so rather than responding in kind, I called her. They didn’t answer, so I left a message. I got no response until I checked my email this morning. She said she tried to call but my email was full. Full? What have I got stored . . .? Oh. So, here’s my story. I save certain voice mails from my kids. The ones that seem indicative of milestones. I usually transfer them to my hard drive and take them off my phone to avoid just the problem that I now have but the last one I got from Zach and the anguished calls from Jeremy and Mom that awful night are still there. I just checked and I did transfer them but I didn’t erase them from my phone. There are a few other, more recent ones, saved. It’s funny, I only had to hear the first couple of seconds of each one of those to bring it all back this morning. I didn’t get much work done for a while after that. Luckily, the theatre was dark and hardly anyone was around. For months I was sure I had a early November voice mail message from Zach talking about his upcoming trip to California with Emily. When I finally went through them carefully, it wasn’t there. I guess I erased it by mistake somewhere along the line. Here’s the last one I have, from the summer before. So far I’ve been reluctant to put up anything like progress reports on my efforts to understand what happened in Baton Rouge on the evening of November 14, 2015. Many people have asked me what I want. I’ve always felt, and I still do, that revenge is not the path to follow. Zach is dead & nothing can change that most important fact. I am unhappy with almost everything the officials of Baton Rouge did – or more precisely didn’t do – in their investigation. Their conclusion that Zach was at fault for entering the street when he shouldn’t have makes me want to scream. Seemingly, everything hinges on the fact that Zach’s Blood Alcohol Content (BAC) was measured at 0.125%. The driver had a BAC of 0 so he’s absolved, goes the narrative. Never mind that he was rat racing another guy to be first past the merge. He got a speeding ticket, BFD. Nancy & I both looked into civil suits. She wanted me to join with her but I declined. I consulted another lawyer who eventually got back to me and said the insurance was ‘only’ $15,000 & I would have to share that with my ex-wife. So evidently their M.O. is to jack up the insurance company. They’re not interested in real questions of responsibility. I consulted yet another lawyer and said I would pay up front to have my questions answered. He sent me to an accident reconstruction specialist who essentially declined to take the job for a variety of technical reasons (he was at least nice enough to explain to me why). The lawyer also suggested that I contact the Baton Rouge District Attorney’s office. He said they generally very responsive to bereaved families. So it has proven to be. I wrote a letter; they called me back. I wrote another letter because I hadn’t written down the name of the lawyer who called me; they called me back again. Both times I came away with the feeling that the lawyer in the DA’s office was sympathetic to my concerns and would make an honest effort at reviewing the investigation. The title of this post comes from the interesting fact that the DA lawyer didn’t have a copy of the coroner ‘report’. I said I did and would send it to him, which I did this morning. I call it a ‘report’ because it is two sentences long. Reading it and trying to read the police report again gave me the impetus to write this post. Jeremy, Ashley, Rosalie & Emily all arrived safely in the Bay Area yesterday and we had a lovely day. At this moment, they are in Santa Clara preparing for their drive to Lake Tahoe. That’s the short version. Now for a longer version. Sarah came and stayed with me Wednesday night. Jeremy’s family arrived at SFO about 9:30 and Sarah went to pick them up. They got to the apartment & had been there less than 15 minutes when I got the text from Emily that she had landed. Ashley went with me to pick her up at the airport. It was Emily’s first time in California. The San Francisco fog was doing its summer thing: sunny and warm, if a little breezy, at the airport, cool and cloudy at the coast. I was amused to see all the Easterners in T-shirts and shorts. They were amused to see me in my long-sleeved shirt and jeans. After some lunch, we headed out to Devil’s Slide trail and Zach’s rock. We were joined there by Teresa and Paul, and Joe and the boys. Jane was already in Santa Clara preparing. It developed that Zach’s rock was less interesting than whales. What I hadn’t realized was that Joe had guaranteed Ashley a whale sighting and she was determined to hold him to it. 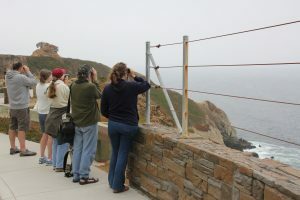 Although we could see a couple of whale watching boats not far offshore, we saw no whale activity. 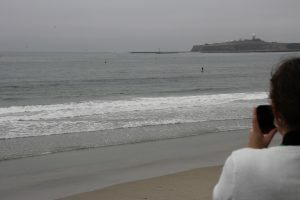 After 20 minutes or so of that, Joe got in his car and went down to Half Moon Bay where he spotted some and called us. There we hit the jackpot. First it was just seeing the back of the whale coming up for air but then suddenly one came charging up out of the water with its mouth wide open all only about 100 yards from where we were standing. Jeremy described Ashley as ‘like a 12 year old at a Justin Bieber concert.’ I have to admit it was spectacular. Joe said they were California Grays. In the course of about 45 minutes of watching, we saw the breaching several more times. I was not quick or lucky enough to get a good picture. This picture gives you an idea of how close they were. About where the guy on the paddle board is. After that, everyone headed down to Santa Clara to Mom & Dad’s. 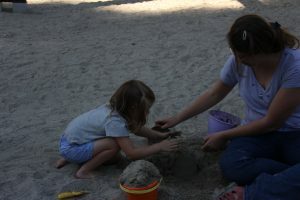 Rosalie went over to the park and played in the sand with Sarah.